Choosing to redesign your website is no small decision. There are tons of moving parts to think about, with potentially the most important being the effect it will have on search engine optimization (SEO). One of the most common concerns I hear from clients is that their traffic will take a nosedive after a redesign. There are usually very strong reservations about redirecting any URLs. Now, consider that you are combining two domains into one, or shifting from one domain to another. Multiply all those fears times 1,000! It is an entirely common occurrence for two brands to merge or a brand name to change, necessitating a complete shift in website domain names. We’ve had plenty of clients work through this process with us, and every single one of them has been fearful of making the domain switch. Many companies have even decided not to make the change just because they are afraid of the SEO implications. Despite the fear that surrounds these kinds of changes, it IS possible to do this successfully. What I want to share with you today is how to make this process go as smoothly as possible should you find yourself in this very nerve wracking situation! The key to making a major domain change successful is the planning you put into your switch. It is important to make sure you know every single URL that you need to consider. This is why we always start with a full audit of our clients’ existing website. At IMPACT, we use a data from a couple of different tools and combine it together to get a full picture. We use Screaming Frog to ensure we get a full list of every URL we need to consider as we are transitioning pages to new URLs. Combining that with data from Google Analytics and Google Search Console allows us to then understand exactly how much traffic is currently coming in to those URLs, what keywords they are performing well for in search, and more. If existing pages are already performing very well for certain keywords, we want to try and preserve as much of that performance as we can. A website redesign is also a perfect time to evaluate what new keywords you should be targeting and develop a strategy to increase the traffic you get from them. As such, one of the first things you should do (before you even determine your website structure) is to do keyword research and build a keyword strategy. It is incredibly important to take this step before you start writing content for your new pages, so you can write them properly. At IMPACT, we always complete a full keyword strategy during the planning phase of a website redesign to see what new keywords should be incorporated. Once we know what keywords our client should be targeting, we next work with them to build the structure of their website (keeping in mind that Google favors a website that is structured around content topic areas) and create an on-page SEO strategy. Our on-page SEO strategy outlines what the target keyword should be for each website page and how it should be linked with major content pillars (which will live as resources and blog posts). At this time, all technical SEO details are planned including URLs and page titles. You’ll be targeting a combination of keywords your old domain was ranking very well for (and you want to keep) as well as new keywords you want to be ranking for. Once we’ve taken this step, content creation can truly begin. Because each website page has a target keyword, the on-page content, meta descriptions, image alt text details and more are easy to create with the end in mind. Now is the point where we’ve gone through the entire planning, design and development process. We have a beautiful, brand new website that has been thoroughly built to target specific keywords. We are ready to push the “start” button, right? First we need to make sure our redirects are set up correctly. This is where we take the full audit we carried out in the Planning and Preparation stage and determine where each of those old URLs will point in our new sitemap. Warning: this is a very tedious process, but it can’t be skipped. It is so important to get this right. Without it, every SEO fear will be realized, including the dreaded traffic nosedive. Someone has to create a spreadsheet that maps every single old URL to the appropriate (and beautifully keyword planned) new URL. These internet "change of address" forms are what are referred to as 301 redirects. Ensure these redirects are uploaded to the appropriate place in your content management system (CMS) to ensure that no traffic will fall through the cracks. Now we are ready to push the “Go” button! Once you’ve brought your new site live, there is one more very important step. It is time to tell Google all about your new sitemap. Make sure you have Google Search Console set up for your new domain (or combined domain) and submit your new sitemap right away. This will get Google started on indexing your new pages as fast as possible. You should expect a couple weeks of minor traffic drops as Google crawls your new site. It will rebound quickly, but don’t be concerned if your traffic drops a bit right out of the gate. In the weeks following launch, it is incredibly important to carefully monitor your traffic and keep an eye on where things are. At IMPACT, we make sure to regularly check client websites using SEMRush. That allows us to see, at a glance, major warning signs that something went wrong. In the months following your launch, you should be keeping a close eye on your keyword performance (especially around your new keywords!) to see if you are improving. It's easy to talk theoretically about this process, but it isn’t real until you see it in action. Am I right? So let’s walk through a successful client example! 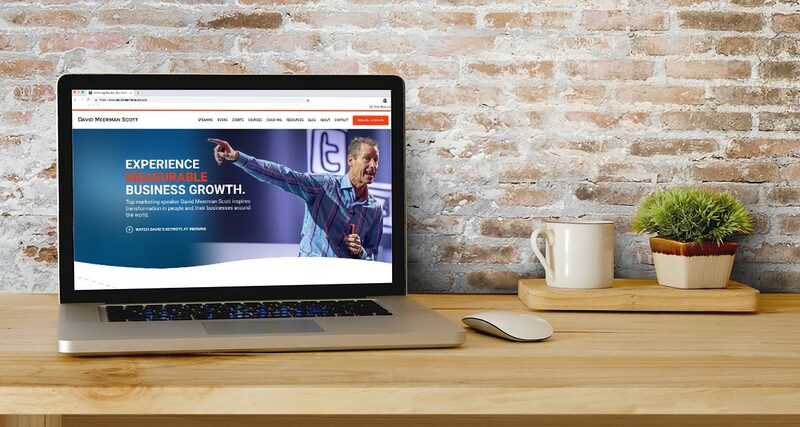 In October 2018, we worked with Marketing Speaker, and long-time IMPACT client, David Meerman Scott to redesign his current website. As part of this process, we worked to combine his blog domain (webinknow.com) with his business website (davidmeermanscott.com). The webinknow.com domain had long been his content production machine. David started blogging there in 2004, and had published well over 1,500 blog posts and other valuable content. He had built its traffic and ranking position significantly and consequently, it was incredibly important to harness the traffic from this domain and try not to lose any major keywords as we moved its contents to the davidmeermanscott.com domain. Additionally, we wanted to make sure the davidmeermanscott.com domain started ranking for some very specific keywords around terms that people searched when looking for speakers (and for which the site wasn’t currently ranking). Prior to the redesign, the two sites were cannibalizing traffic from each other. The two domains had 179 keywords in common that were driving traffic from the top 100 search results. Essentially, the two sites were competing against each other, making it less likely that a user would end up on either one. We went through the entire process outlined above, and these were the results. The total number of keywords the webinknow.com domain was ranking for had been trending slightly downward, hovering between 2,500 and 5,000 over the course of the last year. In the same time period, the total number of keywords the davidmeermanscott.com domain was ranking for had been hovering between 600 and 1,300. In the weeks following the combination of the two domains, traffic to the davidmeermanscott.com domain increased by 359%. The new level of traffic to the website in the month following the launch of the updated site was roughly equivalent to the sum of the traffic to each of the separate websites pre-combination, meaning all traffic was successfully captured and nothing was lost in transition. The new davidmeermanscott.com domain was also now ranking for 5,000 keywords. This included many keywords that both sites had previously been ranking for when they were cannibalizing each other’s traffic. In the month following the redesign, the new (combined) website gained 3,240 keywords for which it had not previously been ranking. Additionally, one month post-redesign, the website started to see traffic from some of the newly selected bottom of the funnel keywords that were specific to terms related to the services David offers. This information should hopefully help you if you are considering combining or changing domains - and allow you to rest a little easier at night when doing so! The process of combining two or more domains can be done quite successfully without sacrificing traffic (and even encouraging traffic growth!). The key is that it must be done right, with proper planning and monitoring.